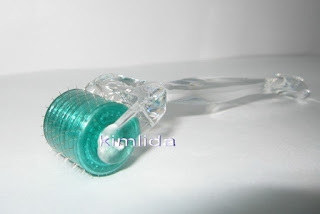 Dermarolling is also known as micro-needling, skin rolling or collagen induction therapy (CIT). Derma Rollers are made of many high grade micro needles which roll over and penetrate the skins upper surface painlessly. These revolutionary devices provide two major benefits. Secondly, they allow the transdermal application of creams, gels and oils, to be absorbed far more effectively - boosting their effectiveness massively. This is relevant to hair loss treatments as well as cellulite reduction. Our How Dermarollers Work page should give you a greater understanding of just how these simple and fantastic devices can benefit you. The results can be amazing and show after just a few dermaroller treatments. You can search on Youtube to see how it's done and also google derma roller and go to images to see some before and after pictures. I'll let you guys know how it is after I receive it and use it for couple weeks.